Due to blowing snow hazards from strong winds, crews with Presque Isle Public Works closed off the entrance to McBurnie Road off Washburn Road in Presque Isle Tuesday morning. Public works also closed Ashby and Centerline roads because of drifting snow and white out conditions. PRESQUE ISLE, Maine — Heavy winds and blowing snow led police agencies to close a number of roads throughout Aroostook County Tuesday, including parts of Route 1 and 11. In addition, many schools, businesses and organizations closed for the day. Shortly before 3 p.m., the Maine Department of Transportation shut down Route 1 between Westfield and Presque Isle, Route 1 north of Caribou to near Van Buren, and a section of Route 11 north of Portage Lake. Aroostook County Sheriff Shawn Gillen said that members of his agency and others have been responding to various traffic issues throughout the day, including a four vehicle accident on Route 1 in Westfield. He urged residents to stay off the roads if possible. For people looking to find out about road conditions, the sheriff’s office advised against calling 911 or dispatch centers and instead recommended visiting the traveller information system website New England 511 at /newengland511.org. Gov. Janet Mills shut down all Aroostook County State offices at 3:25 p.m. Tuesday due to the dangerous road conditions and urged anyone driving home to use caution. “Strong winds, low visibility, and blowing snow make for dangerous driving conditions and I hope that, if you must drive, you will allow extra room for public safety and transportation officials to keep you safe and clear currently impassable roads,” she said. All state offices are expected to reopen for normal operating hours Wednesday. Many Aroostook County pre-K-12 students were marking another snow day due to the blowing snow hazards, according to the National Weather Service in Caribou. Mid-afternoon, the NWS indicated the wind advisory was in effect through midnight. With the high winds following the weekend’s storm that dropped 10-12 inches of snow across The County, the Presque Isle Public Works Department decided to close the Ashby, Centerline, Higgins and McBurnie roads on Tuesday morning until the winds died down. “They won’t be plowed, so emergency services and wreckers won’t be able to reach you,” the Presque Isle Police Department wrote in a notice on Facebook. Around noon, Route 1 between Connor Plantation and Van Buren was also closed until further notice. In western Aroostook County, Garfield Road was closed from Route 11 to the Ashland town line, said Ashland town manager Cyr Martin. Route 11 in that area remained open, as state crews worked to keep it clear, he said. “The state is doing the best they can,” said Martin, who drove from his home in Eagle Lake to Presque Isle Tuesday morning to drop his wife off at the airport for a trip to Florida. The Route 11 corridor from Eagle Lake to Ashland wasn’t too bad Tuesday morning, but many other areas have limited visibility, Martin said. The intense weather also caused difficulty for commuters like Nikki Shields, owner of the Nikki Shields Insurance Agency in Fort Kent. Shields lives in Presque Isle and works out of her Fort Kent office, but decided against that this morning. She said she made it as far as the Aroostook Centre Mall in Presque Isle before turning around and heading home. “I didn’t even get out of town and the drifting and blowing was terrible. Even the side streets were poor visibility. After learning that several roads were closed I turned around,” she said. The weather prompted area schools and some businesses and organizations to close for the day, including the Central Aroostook Chamber of Commerce, Aroostook County administrative offices and the Fort Fairfield town office, library and recreation center. Among other closures are the Aroostook Agency on Aging’s Meals on Wheels program, Catholic Charities and morning bus services with the Aroostook Regional Transportation system. The Caribou Police Department also responded to numerous weather related incidents, with both Administrative Assistant Laura Adams and Chief Michael Gahagan stepping in to answer phones while officers were out assisting motorists. 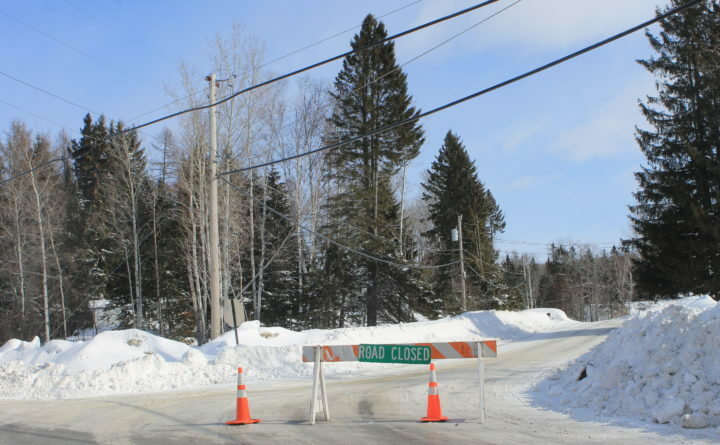 Adams said at 2 p.m. that police have closed the West Presque Isle Road indefinitely, and that about “three or four accidents” were reported at that road’s intersection with Main Street. No additional information was immediately available. Fiddlehead Focus writer Jessica Potila and Aroostook Republican writer Chris Bouchard contributed to this report. Correction: This version corrects an early one that indicated part of Route 11 near Ashland was closed.